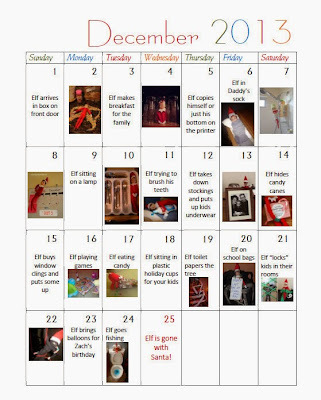 Hi there elf lovers, how did your week go? Can you believe we are down to the final week and a half until Christmas? Terrifying, right? Here is your printable elf calendar to take you all the way. I am ready for Jack to take his leave. It has been fun this year as Zach is excited every morning to find where he has landed, but Jack has also come under greater scrutiny. I get a lot of questions about why we can't touch him, why he can't talk to us, and MOMMY, JAMES TOUCHED JACK!!! The world might be over. The majority of the ideas this year are not mine. Here is a list of the smarter-than-me bloggers I borrowed from!